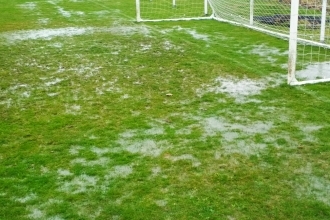 This afternoon's home match against FC Lemsford has been postponed due to a waterlogged pitch. The picture on the right was taken yesterday at 5pm, and demonstrates quite clearly how much rain fell during Friday, to say nothing of the days before. During this morning's pitch inspection it was quite obvious that the pitch was still in a waterlogged state and, had this afternoon's game gone ahead, the surface would have cut up very badly and would have been dangerous to play on. Apologies to Lemsford for yet again postponing the match, but there is nothing we can do about it. What we really need is a week of good weather - and that seems highly unlikely at the moment!